It's Christmas at the cottage by the lake and the bears are busy preparing to celebrate. The human owners of the cottage, however, are in the city feeling glum. Until the idea comes to them to spend the holidays at their cottage. What follows is a set of misadventures as the family arrives without presents--they were left on the train--and without the usual holiday accouterments--the Christmas trees and turkeys are all sold out. But they are in for a treat as the cottage has been decorated by their unseen friends. So the bears unwittingly save Christmas for their human hosts, yet are still able to enjoy their own fine celebration. And, as with the other books, the bears do so all while cleverly avoiding confrontation with their human friends. 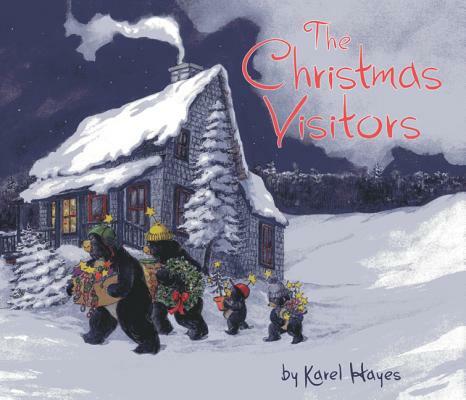 Watercolor artist and illustrator Karel Hayes has participated in solo, juried, and invitational exhibitions throughout the United States. Her paintings have been shown at the Cincinnati Museum of Natural History, the Fine Arts Center in Taos, New Mexico, and in New York City at the Salmagundi Club, the Catherine Lorillard Wolfe Art Club, and the National Arts Club. Her drawings have appeared in several magazines and she has illustrated more than ten books, including Time for the Fair, The Winter Visitors, and Who's Been Here? A Tale in Tracks. She lives with her husband in Center Harbor, New Hampshire. The best historical thriller I've ever read. It's about a team of wonderful characters trying to catch a serial killer at the end of the 19th century in New York City. Think "Criminal Minds" before behavioral psychology was invented. Excellent!